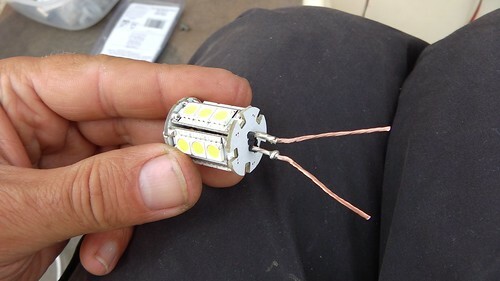 Before you install LED bulbs in your fittings please consider carefully how they might affect the colour and visibility arcs of your lights and the insurance of your boat. 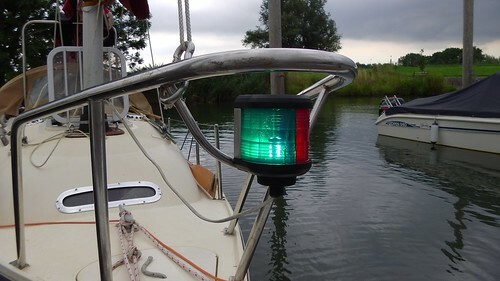 Please check MGN 393 Navigation light units: maintenance and the use of new technology light sources, such as light emitting diodes (LEDs), as navigation lights on SOLAS and non-SOLAS vessels and also I suggest Warning not to use LED bulbs in filament bulb navigation lights from PBO. My battery ran very low after my 32 hour passage from Rye to the Breskens. The main power draws were the tiller pilot, the VHF, and the navigation lights. The lights were the worst, drawing over 2A by the ammeter. I had incandescent bulbs that came with the boat: 10W in the stern and 25W in the bow, so they ought to be drawing 2.9A. 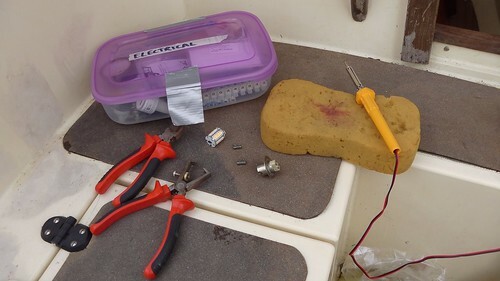 The chandlery in Willemstad had a cool white (6000K) replacement for the stern bulb, but nothing suitable for the bow. If you put a 6000K LED behind the usual green plastic filter then it shows up as blue. The only solution I’ve seen for this is to use an expensive bi-colour LED bulb. 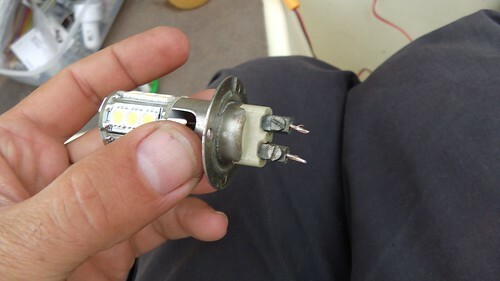 But the chandlery also had warm white (2500K) domestic LEDs with brightness equivalent to 25W. They ought to give the correct colour, and they were much cheaper. The only problem was the fitting. Time for a quick hack with the soldering iron! I soldered some copper flex into the feet of the LED bulb. 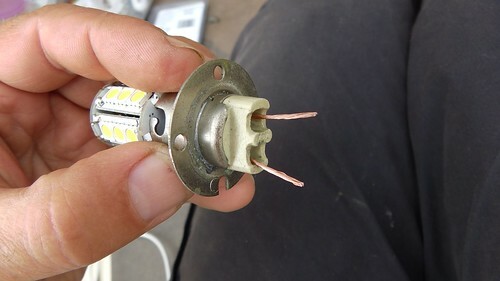 The spring contacts to the bulb unscrew and come out, leaving holes for the flex. The unscrewed contacts have a convenient hole drilled down the centre. I threaded the flex through these holes. Then I just reassembled and tested the bow light. It showed the correct shades of green and red, as you’d expect, since the incandescent bulb would also be at about 2500K. I taped the spring contacts to the old bulb and put it in the spares box along with the old stern bulb. Nothing was destroyed by this hack and it’s easy to put things back as they were if necessary. The current draw for the LED bow and stern lamps was about 200mA, less than a tenth of the incandescent bulbs.